The Sony Cybershot DSC-WX10 is part of Sony's latest mid-range of Cybershot cameras, sitting alongside the more rugged HX9 and the company's 30x superzoom offering, the HX100V. It may not boast the big zooms of the aforementioned – here you get a more-than-passable 7x optical zoom – but it still has a long list of great imaging features. In our tests, the WX10 seems like a very competent compact. Its chassis is 94 x 56.1 x 16.7mm, so it is superslim and fits neatly in the hand. It's light, too, at just 109g. Sony has managed to pack a mode dial on to the WX10's diminutive frame. This is situated on the back of the camera. Give it a quick flick and you can get to most features here, including an improved Sweep Panorama mode, a 3D mode and video. All of these are worth mentioning as they are all worthwhile features. The improvements made to Sweep Panorama now means you can have poster-sized (40MP), the 3D shooting can be played back on a 3D ready TV and the video on board is Full HD, at 1080/50i. In short, these are high-end features not usually seen on a mid-range compact. There's also an addition to the auto modes. Superior auto mode will take a number of images and combine them to create the best image possible. It's like HDR but Sony were reticent to call it this. Whichever way you look at it, it is a worthy addition – even if the consumer may get a little confused having two auto functions on the mode dial. The screen on the back of the WX10 is a 2.8-inch TFT LCD. In the bright shooting conditions we were testing the camera it performed well – there was no cupping our hands over the screen to see exactly what we were shooting. As with the rest of the Cybershot range, the WX10 comes with a 16.2MP Exmor sensor, which is more than enough megapixels for even the most hardened shutter nutter. Although the model we tested wasn't quite the finished article, Sony has impressed us with the WX10. It offers features you would expect on a DSLR in a slimline and very capable compact. 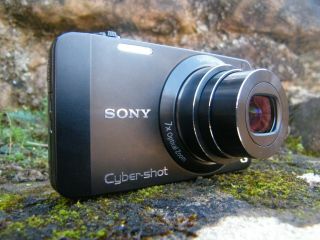 The Sony Cybershot DSC-WX10 UK release date is March, with pricing to be around the £280 mark.